Dear friends, it is an absolute joy for me to bring you this unique and thoughtful computer desk.This product is 100% Brand new multi-purpose square desk with heavy duty metal shelving. Perfect for use in home, the study, office or at the corner and more. Could be used as a writing desk, workstation, computer/laptop desk etc. Sturdy metal frame coated in anti-rust and corrosion-free finish. Industrial grade MDF desktop with a heavy load capacity. Widened desktop provides ampler space for free activity. Solid and anti-deformation material offers greater durability and stability. Protective feet reduces floor damage and easy to clean. If you have any questions, please kindly feel free to contact us, we promise to reply you within 24 hours. [DIMENSIONS & LONG QUALITY ASSURANCE] --- Product size:47.2''×23.6''× 29'', Board Thickness:0.98'', Metal Leg Size:2×2'', G.W. : 44 LB. Can bear 900 lbs. WARMTH NOTICE: If you are not satisfied, before you leave the negative review/feedback, pls. contact us and let me know that, we promised to provide a long quality assurance service to you. [HIGH QUALITY, STURDY AND DURABLE] --- Sturdy metal frame coated in anti-rust and corrosion- free finish,Industrial grade MDF desktop with a heavy load capacity. Solid and anti- deformation material offers greater durability and stability. [SIMPLE, MODERN DESIGN] --- Simple stylish computer desk study table with metal legs and adjustable leg pads. Protective feet reduces floor damage and keep balance. [MULTI-FUNCTIONAL USE] --- Perfect for use in home, study, office or at the corner and more. 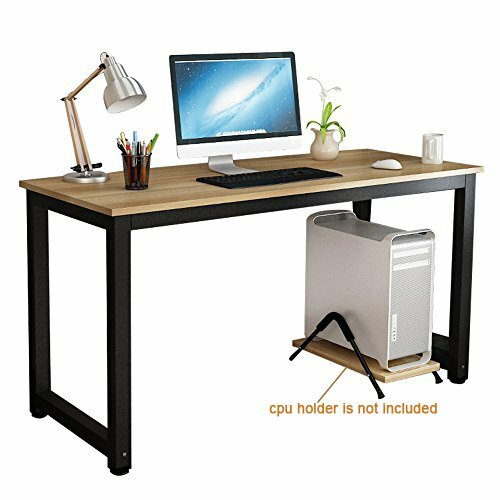 Could be used as a writing desk, office workstation, meeting desk, computer/laptop desk, gaming desk. Can put computer, monitor, printer, table lamp, flowers, keyboards on it. Great for home, school, college students, or for boy and girl's room. If you have any questions about this product by gootrades, contact us by completing and submitting the form below. If you are looking for a specif part number, please include it with your message.